Cuba offers a range of HOTELS, varying from cheap options that offer little more than a bed and air conditioning for street-focused travelers to luxury hotels that match international standards. From colonial pearls that ooze 'Cuba' to glass and steel modern hotels. 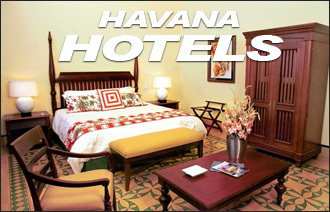 Havana has something for every taste while Varadero, Cubas famous beach peninsula an hour and a half from Havana, mainly has all-inclusive resorts. Some small ones, many large ones, from 3 to 5 stars. Choose a hotel if you want a well-known option with few surprises though you will usually need at least a 4 star hotel to match or surpass the quality, space and location of most casas particulares. 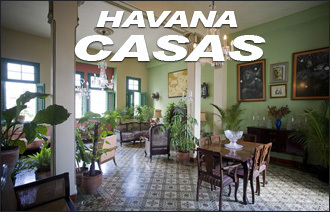 The other popular accommodation option in Cuba are CASAS PARTICULARES, Cubas version of private B&B's. These are private homes with license to rent rooms or complete apartments to tourists. They have all been approved by the state to offer satisfactory standards for tourists. Staying at a casa particular is a good way to get to know Cubans and every day life in Havana or in any other part of the country for that matter. Casas range from small rooms inside the homes of Cuban families to large independent apartments and to huge mansions with pools in the suburbs. It simply means 'private house', so there is no set definition as to how they are. Most of the ones we use are in the city or town center, safe, clean, close to the main attractions and with nice owners used to handling tourists. Choose a casa to travel a bit more 'local' while at the same time keeping the price down. 'Local' does not mean dirty or bad standards, but it doesn't mean five star luxury either. Most of our tours have stays at casas included in them, some for the duration of the trip, some for some of the trip. If you do not want to stay in casas, any tour can be upgraded to stay in hotels instead of casas, or a mix of both. Please note that for the time being we are not offering bookings of hotels and casas particulares as a stand alone service. Tourism being up in Cuba, the best casas particulares are booked solid and most Old Havana hotels and several good provincial hotels are fully occupied several months ahead. We need to be sure we have quality casas and hotels available for clients on full tours with us, so we need to keep them reserved for our full Cuba tours. Also note that it is impossible for us to promise specific casas months in advance. Casa bookings simply work in their own way and being private the owners do not want to block out a few days several months ahead if they risk loosing longer stays. This is why we have chosen not to keep photos of specific casas on the website. This is an honest approach as no agency can promise a specific casa anywhere in Cuba for a few nights. Anyone doing so is using the bait and switch tactic 'hoping' that the casa shown and booked for you will remain available, then switching the tourist to another casa when they arrive if someone else is now staying at the casa you reserved. Which is a bad experience when people have been looking forward to a specific casa. We guarantee the following for people on tours with us staying in casas: Clean, safe, central casas with air condition and private bathroom. If you are comfortable with that guarantee, you will not be unhappy with our range of well-tested and popular casas all over Cuba.